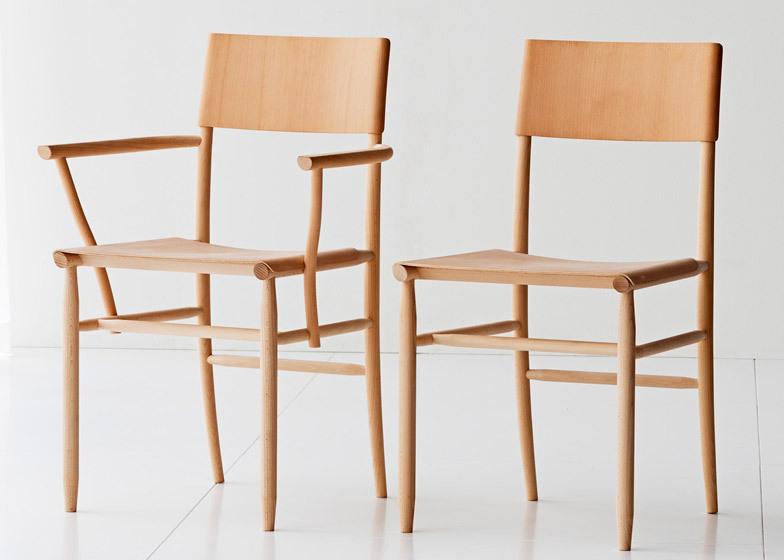 Stockholm 2015: Swedish designer David Ericsson has created a lightweight chair in solid beech – his "all-time favourite wood" – for furniture brand Gärsnäs. David Ericsson's simple Madonna Chair for Gärsnäs takes its cues from an early 19th-century seat from Italy and a traditional furniture design from his home country. "Madonna is a lightweight beech chair of slender dimensions that flirts with the Italian Chiavari chair and the Swedish step stool," he told Dezeen, also mentioning that its name refers to another Italian "icon". "My creative process always takes a long time, and I like to seek inspiration in Swedish, European and ancient furniture history," he said. The chair is formed of slender poles of beech, milled into shape using a computer numerically controlled (CNC) machine for the legs, back supports and horizontal bracing elements. Thin layers of beech veneer are moulded into gentle curves to create the seat and back rest. The designer chose the material for its aesthetic and functional properties. "I revel in beech," said Ericsson, who designed a furniture range made from leather, wood and linen for his thesis project. "It acquires a tremendously beautiful surface, especially when machined. I also appreciate its density and strength." Madonna is available with or without armrests in unstained, black and russet variations. Vegetable-tanned leather can also be selected to replace the sections of veneer. Gärsnäs launched the chair at last week's Stockholm Furniture Fair, where other seat designs presented included a compact-sized lounge chair by Note Design Studio and a chair with a metal frame that mimics the shape of trouser braces by Färg & Blanche. Photography is by Lennart Durehed.